"Anyaeji is a Nigerian artist born in Benin City. She holds an MFA degree in sculpture from the Sam Fox School of Design and Visual Arts, Washington University in St Louis, Missouri and a BA in painting from the Department of Fine and Applied Arts, University of Benin, Benin City, Nigeria. Ifeoma's works have been exhibited nationally and internationally, in group and solo exhibitions, and are in various collections in Africa, Europe, US and Canada. Her work has received international recognition in the form of fellowships/grants and academic awards. She is both a member and founding member of several professional artist associations in North America and Africa. Anyaeji has taught at the university level in the USA and Nigeria and is a PhD candidate at Concordia University, Montreal. The current exhibition, 'A no m'eba ... (I am here, Presence, Absence)’, features sculptures and installations created from discarded plastic bags (individually braided into 'Plasto-yarns'), twine, wood and found objects. 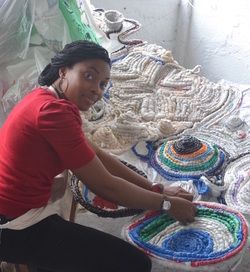 These works employ the process of Upcycling - an environmental reuse concept that engages the discarded object / practice, transforming it from a state of worthlessness to one of value and essence - in combination with the crafting methodologies of a receding Nigerian hair braiding technique known as Threading. In addition to its originality, vibrancy and impressive scale, Anyaeji’s work speaks to many of the socio economic issues of our time i.e., waste, consumerism, notions of beauty, authenticity and newness. The title of the current exhibition is a play on words about the visibility of the African body, which like the discarded object in contemporary society, most often is physically present as a commoditized thing yet 'unseen' as a human entity."